The first of the three presidential debates is coming up on Monday night, and in addition to the spotlight being on Hillary Clinton and Donald Trump, it looks like a big focus will be on live-streaming. That’s because Facebook, YouTube and Twitter - each of which is pushing hard into live-streaming - will stream the debates, in partnership with a variety of major media companies. YouTube will be streaming in partnership with PBS, Fox News, The Washington Post, Bloomberg and Telemundo as part of its #voteIRL initiative. Facebook has once again partnered with ABC News (as it did for the conventions) to stream the debates, which it will enhance with viewers’ comments and conversations in Facebook Live. Finally, as part of its previously-announced partnership, Twitter will be streaming Bloomberg TV’s coverage of the debates. Yesterday morning, just after I posted “5 Reasons Why Facebook Spending $50 Million on Live-Streaming Content is So Smart,” C-SPAN’s cameras in the U.S. House of Representatives were turned off by House Speaker Paul Ryan as Democrats began a sit-in to protest gun control legislation not being brought to a vote. But then, an extraordinary thing happened: various Democratic Representatives began live-streaming the protest via Facebook Live and Periscope, with C-SPAN picking up the feeds. The 2012 presidential election is already in full swing, and in early primary states that's meant a barrage of TV ads from well-funded candidates. But with viewer behaviors shifting away from traditional TV, the Internet has become an increasingly important way of reaching voters. And with online video usage surging, the latest battleground is how to leverage this new medium to their advantage. Enter the new "Jivox Political Ad Kit," an interactive, multi-screen, social media-enabled product from video ad technology provider Jivox. Broadband video marches to the TV - At CES in early January there were major announcements around connecting broadband to TVs, either directly or through intermediary devices (a recap of all the news is here). All of the major TV manufacturers have put stakes in the ground in this market and we'll be seeing their products released during the year. Technology players like Intel, Broadcom, Adobe, Macrovision, Move Networks, Yahoo and others are also now active in this space. And content aggregators like Netflix and Amazon are also scaling up their efforts. Some of you have heard me say that as amazing as the growth in broadband video consumption has been over the last 5 years, what's even more amazing is that virtually all of it has happened outside of the traditional TV viewing environment. Consider if someone had forecasted 5 years ago that there would be this huge surge of video consumption, but by the way, practically none of it will happen on TVs. People would have said the forecaster was crazy. Now think about what will happen once widespread TV-based consumption is realized. The entire video landscape will be affected. Broadband-to-the-TV is a game-changer. Broadband video advertising continues to evolve - The single biggest determinant of broadband video's financial success is solidifying the ad-supported model. For all the moves that Netflix, Amazon, iTunes and others have made recently in the paid space, the disproportionate amount of viewership will continue to be free and ad-supported. This month brought encouraging research from ABC and Nielsen that online viewers are willing to accept more ads and that recall rates are high. We also saw the kickoff of "the Pool" a new ad consortium spearheaded by VivaKi and including major brands and publishers, which will conduct research around formats and standards. Three more signs of advertising's evolution this month were Panache's deal with MTV (signaling a big video provider's continued maturation of its monetization efforts), a partnership between Adap.tv and EyeWonder (further demonstrating how ecosystem partners are joining up to improve efficiencies for clients and publishers) and Cisco's investment in Digitalsmiths (a long term initiative to deliver context-based advanced advertising across multiple viewing platforms). Lastly, Canoe, the cable industry's recently formed ad consortium continued its progress toward launch. Broadband Inauguration - Lastly, January witnessed the momentous inauguration of President Barack Obama, causing millions of broadband users to (try to) watch online, often at work. What could have been a shining moment for broadband delivery instead turned into a highly inconsistent and often frustrating experience for many. In perspective this was not all that surprising. The Internet's capacity has not been built to handle extraordinary peak load. However on normal days, it still does a pretty good job of delivering video smoothly and consistently. As I wrote in my post mortem, hopefully the result of the inauguration snafus will be continued investment in the infrastructure and technologies needed to satisfy growing demand. That's been the hallmark of the Internet, underscored by the fact that 70 million U.S. homes now connect to the 'net via broadband vs. single digit millions just 10 years ago. I remain confident that over time supply will meet demand. There has been no shortage of stories in the last few days about the travails many people experienced when trying to watch President Obama's inauguration via broadband. While things worked flawlessly for many, for far too many others it was a frustrating and unfulfilling experience. As I wrote on Tuesday, the first "Broadband Inauguration" was a milestone opportunity for this new medium. Instead, it was a confusing flameout. While I'm disappointed, I can't say I'm terribly surprised. Even as I was writing Tuesday's post, I found myself wondering if the Internet was really up to the task of handling this colossal and highly compressed live event. What I experienced personally that day, and have heard and read since, all underscore the massive inconsistency in users' experiences. For example, Hulu worked fine for me. But when I tried to watch on CNN.com I couldn't even get the Flash plug-in to download (and btw CNN, talk about an inopportune time for a download!). I had no luck at NYTimes.com either. One person I spoke to this week said he couldn't get a stream at any of the major news sites and ended up watching at MLB.com of all places. Conversely, others reported no problems at all. No doubt you have your own particular stories. So here's an attempt at putting all of this into perspective: no communications or transportation system is ever built to serve extraordinary peak demand. Instead they are built to serve typical demand plus an increment for periodic bursts. We don't have 15 lane highways so there's no congestion on Thanksgiving Day, while the other 364 days of the year 90% of the space is unused. Likewise, on inauguration day, wireless carriers were urging attendees to refrain from using their handsets for fear of overloading their networks. I can even remember back to the '80s when on heavy call days like Mother's Day, Ma Bell's gold-plated network would sometimes stymie me with an "all circuits busy" message. And these are just a few examples. The reason things are this way is purely financial. It simply doesn't make economic sense to invest in so much extra capacity that's unused most of the time. No venture capital or institutional investor would tolerate capex budgets not supported by realistic use cases. The result is that on surge days like on Inauguration Day incremental available capacity is quickly swamped and many users expecting a flawless typical experience are disappointed. If that's the sobering reality, then here's some good news. Tuesday's massive broadband interest, coupled with other heavily viewed live events, will likely spur further investment in all links in the Internet/broadband delivery chain. History shows us this is true. We may not have 15 lane highways today, but we often do have 4-5 lanes instead of old dirt paths because of cars' growing popularity 50-60 years ago. And we have 5, 10 and even 50 mbps broadband service now instead of pokey old dialup because Internet usage has soared in the last 10 years, demonstrating users' widespread willingness to pay and prompting huge broadband ISP investments. For all of broadband's progress, it is still a relatively nascent medium. "Rome wasn't built in a day" as my father used to admonish me in my moments of adolescent impatience. On Tuesday, broadband's limitations became obvious. That was unfortunate, but I'm betting that next time around will be better. Hey Politico.com: Improve Your Overlay Ad Targeting! This is quite funny, but also very embarrassing. Yesterday I was watching coverage of President Obama's first day on the job at Politico.com, one of my favorite political sites. Politico eschews pre-rolls in favor of overlays which is great because most of their videos are short clips. But look at the graphic below and note the overlay running while President Obama is discussing the serious matters of governmental transparency and senior staff pay freezes. It is promoting a diet technique, and includes the obligatory "before" (flabby) and "after" (flat) tummy pictures. Clicking through brings you to a faux-blog page which is in turn a promotion for Nature's Best Acai Berry weight loss pills. 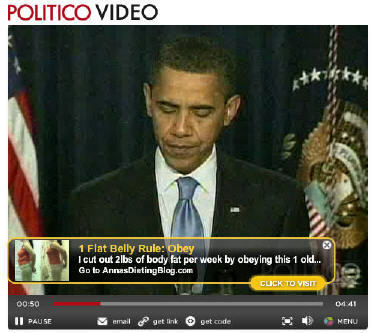 Hey Politico: what in heaven's name is this ad doing running during President Obama's somber remarks? Did Obama get tagged with "fit" or "great abs" based on his recent Hawaii vacation, thereby mapping any ad with "belly" or "diet" to him? If so, someone needs to tweak the system. And by the way - this is the kind of stuff that really undermines your brand. If you're going to expand into video, make sure someone is tasked with knowing what ads you're running so they don't end up embarrassing you! Another milestone in broadband video's evolution will be marked today with the first "Broadband Inauguration." Like last summer's Olympic games, broadband will make it possible for millions of viewers around the world to experience Barack Obama's dramatic inauguration. Last Thursday Mediaweek had a pretty good roundup of all the various news and entertainment web sites that are going to be streaming the proceedings live. Clearly there is going to be an intense battle for online viewers today, with various interactive and participative offerings planned. While the bells and whistles will be fun, for me what's most noteworthy about the broadband coverage is the unprecedented access and sheer convenience that broadband has introduced for so many people. This will be particularly noticeable today for office-workers who lack access to a TV. For them broadband means they won't miss any of these historic moments. That's pretty transformative, and powerful. Ordinarily VideoNuze is focused on the disruption and opportunities that broadband video is creating throughout the media landscape. But what the broadband inauguration (and President-elect Obama's use of the medium during his campaign as well as his weekly YouTube addresses) also shows us is that at a far more important societal level, broadband may be the most powerful communication and engagement technology ever created. The new President's call for an "era of responsibility," will be greatly facilitated by broadband's unprecedented ability to connect him directly to the world. The broadband inauguration is indeed a big milestone. I expect many more are yet to come. Back in December, 2007, in my 6 predictions for 2008, I wrote that "2008 is the year of the broadband presidential election." As I re-read those thoughts last night, and reflected on the long campaign that finally comes to a close today, I found myself stunned at just how influential broadband video turned out to be this year. Consider all of the following: the Obama speech on race now viewed 5 million+ times on his YouTube channel, the breaking of the Jeremiah Wright rants online which were then replayed countless times, the numerous campaign ads aired online first and then migrated to TV, the YouTube debates with user-submitted video questions, the Hillary Clinton crying episode in NH which helped to resuscitate her campaign, the Saturday Night Live Palin sketches that became a viral phenomena, and so on. In so many ways, broadband video is tailor made for presidential campaigning; in 2008 that became evident. It allows direct, high-impact communications with a huge, dispersed audience, circumventing expensive TV advertising. It augments fund-raising, the lifeblood of all campaigns, by allowing potential donors to get an unprecedented "feel" for the candidate. It allows the candidate to amplify messages in totally unstructured ways. And, along with other web 2.0 tools, it gives the candidate an always-on channel to stay close to supporters, thereby sustaining their interest and enthusiasm. But it also upends many of the traditional notions about how to manage and control campaigns. With video capture so pervasive, any false move or off-script moment can become the next big game-changer. The news cycle, once so carefully orchestrated by campaigns to carry their messages into voters' living rooms at prescribed hours is now a thing of the past. In fact, in this election mainstream media outlets took to trolling YouTube and other web sites, scrounging for the latest hot video or tidbit of news. All of these things break a campaign's normal rhythms. There has been a lot said about "change" in this election. What actually comes of those assertions will become better understood beginning tomorrow. What is for certain however, is that if you're a politician or a campaign manager, the 2008 broadband presidential race has permanently changed the way you'll pursue your craft in the future. For voters that's incredibly empowering and for democracy it's enormously invigorating. Brightcove 3 is released - Back in June I wrote about the beta release of Brightcove 3, the company's updated video platform. Today Brightcove is officially releasing the product. I got another good look at it a couple weeks ago in a briefing with Adam Berrey, Brightcove's SVP of Marketing. I like what I saw. Much more intuitive publishing/workflow. Improved ability to mix and match video and non-video assets in the way content is actually consumed. New emphasis on high-quality delivery to keep up with ever-escalating quality bar. Flexibility around video player design and implementation. And so on. The broadband video publishing/management platform is incredibly crowded, and only getting more competitive. Brightcove 3 ups the ante further. Silverlight 2 is released - Speaking of releases, Microsoft officially unveiled Silverlight 2 yesterday, making it available for download today. I was on a call yesterday with Scott Guthrie, corporate VP of the .NET developer Division, who elaborated on the details. NBC's recent Olympics was Silverlight 2 beta's big public event, and as I wrote in August, the user experience was seamless and offered up exciting new features (PIP, concurrent live streams, zero-buffer rewinds, etc.). A pitched battle between Microsoft and Adobe is underway for the hearts and minds of developers, content providers and consumers. Silverlight has a lot of catching up to do, but as is evident from the release, it intends to devote a lot of resources. Can you say Netscape-IE or Real-WMP? This will be a battle worth watching. Google and Seth MacFarlane are hitting a home run with "Cavalcade of Comedy" - A month since its debut, Google/YouTube and Seth MacFarlane seem to have hit on a winning formula at the intersection of video syndication, audience growth and brand sponsorship. On YouTube alone, the 10 short episodes have generated over 12.7 million views according to my calculations, while this TV Week piece quotes 14 million + when all views are tallied. NBC/SNL and Tina Fey set a new standard for viral success - Tina Fey's Sarah Palin skits are hilarious and unlike anything yet seen in viral video. Usage is through the roof: a new study by IMMI suggests that twice as many people watched the skits online and on DVR than did on-air, while Visible Measures's data (as of 3 weeks ago! ), shows over 11 million video views. SNL is smack in the middle of the cultural zeitgeist once again, with Thursday night specials and reports of a new dedicated web site in the mix. To put in perspective how disruptive viral video can be to the uninitiated, several weeks ago I heard a pundit on CNN's AC360 dismiss the potential impact of the Fey skits on the election with a wave of his hand and a remark to the effect of "come on, how many people stay up that late to watch SNL really?" How's that for being out of touch with the way today's world really works? Political pros and other taste-makers should take heed - viral video can be a cultural tour de force. Joost Flash version is here, finally - Remember Joost? Originally the super-secret "Venice Project" from the team that made a killing on KaZaA and Skype (the latter of which was acquired by eBay, permanently undermining former eBay CEO Meg Whitman's M&A acumen), Joost today is announcing its Flash-based video service. You might ask what took the company so long given this is where the market's been for several years already? I have no idea. But here's one key takeaway from Joost's story: because of its lineage, the company was once regaled as the "it" player of the broadband video landscape. Conversely, Hulu, because of its big media NBC and Fox parentage, was dismissed by many right from the start. Now look at how their fortunes have turned. When your mom used to tell you "don't judge a book by its cover," she was right. Hulu to Stream Tonight's Presidential Debate; Reaction to NYTimes.com Coverage? There are reports today that Hulu intends to stream tonight's second presidential debate along with the third debate planned for Oct. 15th. 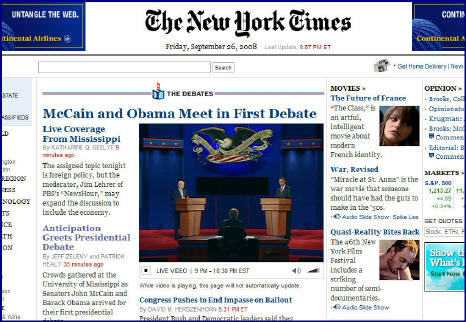 VideoNuze readers will recall that I observed two weeks ago that NYTimes.com streamed the first debate on its home page. I regarded this as a noteworthy incursion of a print publisher onto broadcast/cable's traditional turf and asserted that the debates give the NYTimes a plum opportunity to use video to expand its audience appeal and ad revenue potential. Cause and effect that Hulu, backed by two broadcasters Fox and NBC, is now planning to stream the remaining debates? Hard to say. But no question, if Hulu hadn't done this, it would have been leaving the door open, again, for NYTimes to be a prime destination for live streaming of the debate. For broadcasters fighting for every eyeball out there, that would have been a mistake. More evidence of how broadband is creating competition between previously disparate media worlds. Here's a classic example of how broadband is causing traditionally distinct worlds to collide: on Friday night the NYTimes.com opened up a dedicated streaming video window on their home page, where the presidential debate played for the full hour and a half. I watched the first half of the debate there, before switching on the TV and watching it on CNN HD. While HD was obviously superior, the NYTimes.com's video was more than adequate (though disappointing there was no full screen option). Saturday morning and NYTimes.com is offering the video on demand, with an accompanying full written transcript. You can search (try typing "wrong" to see), to get how many times each candidate used that term, and then jump to the points in the video when it was used (alas, it would be great if the Times gave the ability to clip that specific segment and virally distribute it). The Times does offer a "check point" feature, where it fact checks the candidate's assertions. Note that other sites like ABCNews.com and CNN.com have the debate on demand today as well, but not the interactive features that NYTimes.com has. Stop and consider how significant all of this is - a print publisher using broadband to offer a clear alternative to broadcasters and cable networks in carrying high-quality video. It's a great value proposition just for people without access to TVs at the moment of the live event, but more important, it provides a glimpse of some very interesting additional opportunities for NYTimes.com. For example, the site could host its own post-debate punditry show, assembling its all-star lineup of daily Times columnists. Dedicated Times readers would no doubt love to see a roundtable with Frank Rich, Tom Friedman, William Kristol, Maureen Dowd and others dissect the candidates' performances, rather than waiting for their thoughts to come in columns over the next several days. Also think about how this type of show would scoop Sunday talk shows like NBC's "Meet the Press" or ABC's "This Week with George S." in bringing serious punditry to political junkies who can't wait. In fact, the NYTimes.com could even offer viewers the ability to interact with their columnists, building on the wildly popular commenting feature already available with each daily piece in the paper itself. This type of immediacy and interactivity would be very compelling. The site could also offer the live debate video stream with a companion chat area that would enable viewer engagement during the debate itself (see Paltalk for an example of how this could work). And last but not least, NYTimes.com could offer a single premium sponsorship slot to underwrite its whole debate coverage. Think Mercedes, Four Seasons, Cartier or other upscale brands might be interested? As I've said many times, broadband blurs previously siloed worlds, bringing more competition to traditional players like broadcast and cable networks. They now need to deliver more to stay competitive. For video entrants like NYTimes, broadband creates enormous new opportunities to both leverage core assets/talent and pioneer new and different ways to create value. Another reminder why broadband is so disruptive for so many. Broadband video advertising was a key story line in August, as it seems to be every month. The industry is rightly focused on the ad model's continued evolution as more and more players in the value chain are increasingly dependent on it. This month, in "Pre-Roll Video Advertising Gets a Boost from 3 Research Studies," I noted how recent research is showing that user acceptance and engagement with the omnipresent pre-roll format is already high and is improving. However, as many readers correctly noted, research from industry participants must be discounted, and some of the metrics cited are not necessarily the best ones to use. I expect we'll see plenty more research - on both sides of pre-roll's efficacy - yet to come. Meanwhile, comScore added to the confusion around the ad model by first highly ranking YuMe, a large ad network, very high in its reach statistics, only to then reverse itself by downgrading YuMe, before regrouping entirely by introducing a whole new metric for measuring reach. In this post, "comScore Gets Its Act Together on Ad Network Traffic Reporting," I tried to unravel some of this mini-saga. Needless to say, without trustworthy and universally accepted traffic reporting, broadband video is going to have a tough slog ahead. And speaking of a tough slog, the first "Broadband Olympics" were a huge triumph for both NBC and all of its technology partners, yet their accomplishments were overshadowed by a post-mortem revenue estimate by eMarketer suggesting NBC actually made very little money for its efforts. This appeared to knock broadband video advertising back on its heels, yet again, as outsiders pondered whether broadband is being overhyped. The Olympics became a hobbyhorse of mine in the last 2 weeks as I tried to clarify things in 2 posts, "Why NBCOlympics.com's Video Ad Revenues Don't Matter" part 1 and part 2. These posts triggered a pretty interesting debate about whether technology/operational achievements are noteworthy, if substantial revenues are absent. My answer remains a resounding yes. But having exhausted all my arguments in these prior posts, I'll leave it to you to dig in there if you'd like to learn more about why I feel this way. VideoNuze readers know that another favorite topic of mine is how widespread broadband's impact is poised to become, and in fact already is. A number of August's posts illustrated how broadband's influence is already being felt across a diverse landscape. Here's a brief sampling: "Vogue.TV's Model.Live: A Magazine Bets Big on Broadband" (magazines), "Tanglewood and BSO Pioneer Broadband Use for Arts/Cultural Organizations," (arts/culture), "American Political Conventions are Next Up to Get Broadband Video Treatment," (politics), "Citysearch Offering Local Merchants Video Enhancement," (local advertising) and "1Cast: A Legit Redlasso Has Tall Mountain to Climb" (local news). I expect this trend will only accelerate, as more and more industries begin to recognize broadband video's potential benefits. That's it for August and for the busy summer of '08. Lots more action to coming this fall! As the first "Broadband Olympics" begin to wind down, the American political conventions are next up to get the broadband video treatment. While certainly not Olympian in their popularity, the conventions still have a rabid following among many, and given the particular dynamics of this year's election cycle, they are attracting far broader interest than usual. The conventions have evolved a lot over the years. Traditionally they were a high-stakes drama culminating in a roll call vote whose outcome was often uncertain. They have become a largely drama-free corporate-sponsored schmooze-fest punctuated by a few high-profile keynote and nominee acceptance speeches. Broadcasters have taken note, steadily reducing their coverage and opening the door to cable networks to do the primary convention coverage. Democrats plan to deliver live, gavel-to-gavel HD streaming at their site. Republicans plan live streaming as well and announced Ustream.tv as their official partner. The Democrats also plan a Spanish language simulcast produced by Comcast, to be available online and also on-demand for Comcast subscribers. The Dems are also producing a 15 minute daily show called "Countdown to America's Future" available through Comcast VOD and online. CBS anchor Katie Couric is taking on broadband assignments, delivering web-only specials for the first time. Politico.com and Yahoo have partnered with the Denver Post and St. Paul Pioneer Press to host a series of eight political forums which will be streamed live. Corporate siblings WashingtonPost.com and Newsweek.com will deploy a team of journalists providing live streaming via their cell phones using an application from Comet Technologies. Meanwhile, in the lead-up to the conventions, the YouTube Convention video contest, asked users to answer the question, "Why are you a Democrat/Republican in 2008?" Winners are here and here. For those that don't take their politics too seriously, Jon Stewart, Stephen Colbert and many other comedians will no doubt have viral clips flying around the 'net. Going one comedic step further, Generate and MSN announced just this week the premiere of "Republicrats" a satirical broadband-only series with 24 episodes running though Election Day. I'm sure there's more broadband convention coverage I've missed, so please post a comment regarding further coverage. Yesterday came a further positive sign that user-generated video may be elevated from the domain of karaoke-singing cats, faux-skateboarding accidents and exploding soda bottles. 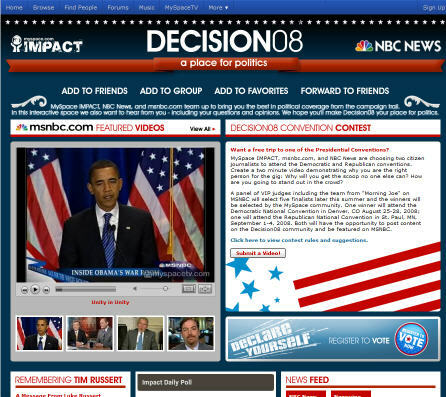 That positive sign was MySpace, NBC and MSNBC's announcement of a new citizen journalism initiative dubbed the "Decision '08 Convention Contest." In it, MySpace users are encouraged to submit short videos answering one of three questions, "Why do you vote?" "Why are you the best person for this job?" or "How will you stand out in the crowd and get the scoop no one else can?" The submissions will first be judged by a panel of experts from MySpace and NBC, with five finalists revealed for the MySpace community to vote on. Two winners will be selected, one to attend the Democratic convention this summer, and the other to attend the Republican convention. I like the Decision '08 contest for a variety of reasons. First and most importantly, it allows UGV to be directed to an important social use: increasing citizens' involvement in the democratic process. In this way it continues on what YouTube's YouChoose '08 pioneered by allowing its users to upload video questions in the recent primary debates. It may sound somewhat idealistic, but I really like the notion of broadband video doing its part to strengthen the functioning of America's democracy - even more so as we approach July 4th in this election year. Further, I think the convention contest provides an example for how others outside the political realm might consider harnessing the creativity and passion of their members to use UGV in a directed purpose. One example that comes right to mind is in the education field. For example, wouldn't it be cool if educators uploaded UGV of themselves in action, explaining and demonstrating their proven teaching methods? I got a glimpse of some of this happening already, while doing a project last summer for the George Lucas Educational Foundation. There's no shortage of other examples. There has been much hand-wringing about whether UGV can ever be monetized through advertising, a debate that will no doubt rage on. Alternatively, I for one would like to see more energy put into purpose-driven UGV projects like the MySpace-NBC convention contest. While I enjoy the cats, skateboarders and soda bottles as much as the next guy, I continue to believe the UGV medium can ultimately be so much more. 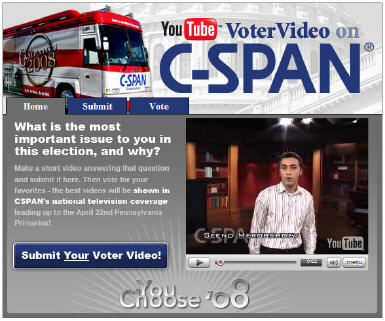 Broadband video's influence on Election Year 2008 grew further with today's announcement of the "YouTube Voter Video on C-SPAN" initiative. To build momentum toward the Pennsylvania primaries on April 22nd, the companies are inviting viewers to upload to the C-SPAN channel on YouTube videos answering the questions "what issue in this election is most important to you, and why?" C-SPAN will air a selection of the videos on its "Road to the White House" program beginning April 13th. I think this is a clever, fun idea to help drive awareness and share disparate views on the election. Though participation is completely self-selected, it will certainly offer much-needed dimension to the dry polling results constantly churning through the media. Combined with the CNN/YouTube debates from a couple months ago, Election Year 2008 continues to show how much more dynamic and inclusive the process becomes with broadband video's influence. Back in December, in 6 Predictions for 2008, I suggested that "2008 is the year of the broadband presidential election." This seems to become more evident with each passing week. I find that particularly when watching cable news, YouTube's influence just keeps on growing. For example, I'm a fan of "AC360" on CNN, which I try to catch at 10pm each night. This week the show was constantly replaying the YouTube videos of Rev. Jeremiah Wright that have dogged the Obama campaign. Conversely, a few weeks ago, Obama got a great tailwind from the massive attention paid to the viral "Yes We Can" music video sensation by will.i.am. That of course was on top of the earlier "Obama Girl" phenomenon. Separately, the McCain campaign just yesterday fired a campaign worker for posting a controversial video on YouTube about Obama and race. This too was covered on AC360 last night. Then of course there were the YouTube co-sponsored debates, offering video-based questions that were constantly replayed afterward. The point of all this is that broadband video has turned election coverage upside down, making it incredibly hard for candidates to control the political newscycle. The "democratizing" effect of YouTube means that on any given day, at any given moment, something may get posted which diverts the campaign's attention. And with major media outlets paying such close attention to YouTube, everything is immediately amplified. Not since the early 1960s when TV began influencing presidential politics have we seen a new medium have such a profound impact on an election. And we still have 8 months to go until November...who knows what's yet to come! On to something more fun, if you haven't yet checked out Sports Illustrated's new "SI Vault" site just launched this week, I suggest you do. It's a highly addictive trip down memory lane. SI has digitized all of its assets and also made available non-SI content, all in one easy-to-use location powered by Truveo. Focusing on video, I found Franco Harris's "Immaculate Reception" from the 1972 Steelers-Raiders playoff game and also Doug Flutie's famous "Hail Mary" pass to beat Miami in 1984. I could have spent hours at the site, although it's not perfect. I tried finding Tom Watson's 1982 U.S. Open chip-in at Pebble Beach to beat Jack Nicklaus, but alas no results were found. 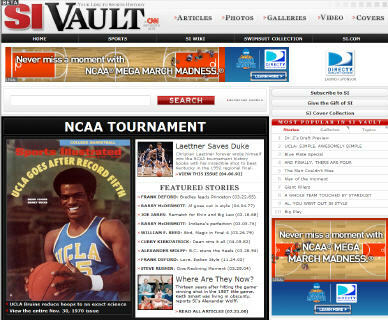 Obviously all this stuff is available elsewhere online, but SI Vault creates a great context for sports fans to enjoy themselves, wrapping SI and non-SI content together in one nice package. 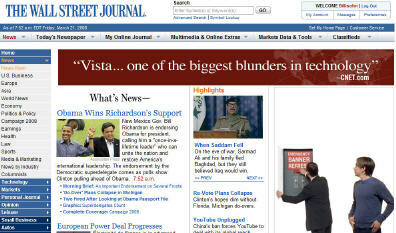 And for even more fun, I encourage you to check out WSJ.com and NYTimes.com today. Apple is "roadblocking" the home pages of both again with a new Mac vs. PC ad, as they did back on Jan. 17th. This means that Apple has bought out all the home page leaderboard inventory on these 2 sites, so every time a visitor comes today, they see the same Apple ad. With all the talk about broadband video advertising, pre-rolls, overlays, etc, Apple again shows with its roadblocks how a little bit of creativity with rich media ad units can go a really long way. The ads are a great mix of interruption and opt-in and are no doubt highly effective branding units for Apple. Have a look and enjoy.